Jimi Manuwa released his first statement after being forced out of his scheduled bout against Thiago Santos this weekend due to injury. Jimi Manuwa will have a long trip home from Brazil to England. The British slugger had already traveled to Sao Paulo for his upcoming fight against Thiago Santos where they were serving as Saturday night’s main event but an injury occurred after he arrived there to finish up his training camp. 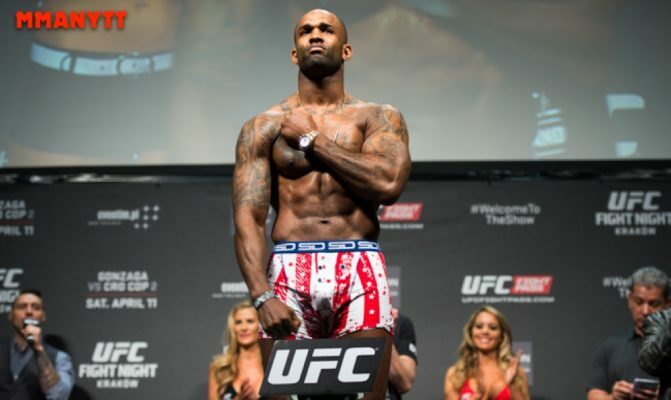 Manuwa released a statement on Tuesday after he was replaced by Eryk Anders, who will now bump up to light heavyweight to face Santos in the new headliner for the UFC’s return to Brazil. “I’m truly gutted,” Manuwa wrote on Instagram. “The day after I landed in Brazil I went for my last hard training session. During that session of sprints I tore my hamstring, and after getting it assessed in hospital, doctors diagnosed it as a severe tear greater than 50-percent. They told me it will be a minimum of six weeks recovery time. It was an unfortunate ending for Manuwa as he was looking to get back on track following back-to-back losses in his most recent performances. Now it appears the heavy-handed striker from England will have to sit out for at least the next six weeks to allow his hamstring injury to heal before he can book another fight. The UFC has already started filling up the remaining cards in 2018 so it’s tough to tell whether or not Manuwa will be healed in time to book another fight before the year is over.